Yeah, I would love to get the full bundle, but $50 is more than I'm willing to pay. Just checked the amount of dlcs there are for RPG Maker MV. Three letters: O M G!!! WinGameStore started their Halloween sale. Among other things, they have several Telltale games on sale, if anyone wishes to pick them up before they are eventually removed. yep, that seems fair for MG Survive... bought! So is Metal Gear Survive a fun game? This far the big thing with Survive is just to go in knowing it’s a spin-off. It can be a little rough at first, but gets easier the farther you get in. Sorry for going a bit OT, but Jawmuncher, I stopped playing the game after 20 hours, in order to play something else. How long would it take me to get all items from the current Halloween event? Survive it is an interesting take on the survival genre but it is a pity that all the classes and more advanced stuff is locked until you finish the single player campaign. In my opinion this a huge design flaw that could have improved the game greatly. All in all it is worth a try. I played it for 40ish hours in single and multi and it was fun for the most part. The new Indiegala Hump bundle is actually not too bad. It's on sale price for another one and a half hours, and it includes games such as Space Rogue, AntVentor, Skein, and Jump Gunners. I wouldn't pay "full" price for any IndieGala bundles. They do Happy Hours which you can buy multiple copies of the same bundle. But then you have to split the cost with others. Or give them away. Cool! 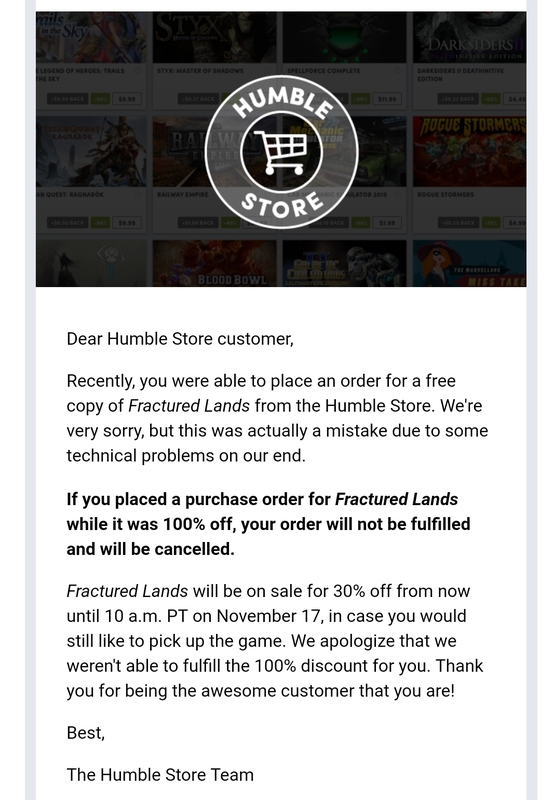 I was thinking they'd partner with Humble again! Edit: Lol, they already did! Guess Overwatch will be free in a few months. Yeah, thats true Overwatch is still popular. They also have their Overwatch League on ESPN so that should help. You can get an EUR/USD 15 code sent to your e-mail for use with a future purchase. Not sure if this has been posted but apparently there's a big bundle of THQ games for PS4 here. Thanks for the heads-up, Tizoc. I never used Razer, is there any coupon or special deal around for first time buyers? And can you please let me know if that 15 EUR code be used for anything (even pre-orders)? For how long? I was planning to wait a while longer for Black Clover, but I may bite to get those 15 EUR off another purchase. Or get Shadow of War: Definitive Edition. Would I be able to get 2 coupons, if I buy two games that are part of that deal? Just to clarify: First off you are purchasing during the weekend and the code will be sent during the next week. So if you could buy 1 item now, say Black Clover, then wait til you get your code before Friday, you can use it with Shadow of War to get another code. Now their EUR/USD 15 code has one restriction: It can only be used on purhcases that total EUR 15 or more. If there is an EUR 8 or so title that catches your interest, get the other game+8 to drop the price to EUR 16, and get another code for use in a future purchase. Thanks for the info, Tizoc. I'll probably do just that. You played more of it than I did lol. I'm going really slow with it. *Offer valid to new Viveport subscribers 14 years of age or older and within the country of origin who purchase a prepaid Viveport subscription between 12:00 AM PT on November 6, 2018 until 11:59 PT on November 14, 2018, while supplies last. HTC Account required, compatible VR hardware/PC and internet access necessary (sold separately). Code will be sent by November 18, 2018. Not valid on any prior orders or purchases; cannot be transferred or otherwise redeemed for cash or other promo code(s). May not be combined with other offers. Void where prohibited or restricted by law. HTC reserves the right to modify or discontinue this offer at any time. Limit one code per subscription account. Other exclusions or limits may apply. I actually have the car one on my wishlist and they bury it inside a Leisure Suit Larry bundle that's been bundled 3 times this year. Game a major update that improves performance+difficulty options to make the game easier or harder for you preference. BTA: Orwell IIS, Rain World, 60 Seconds! Humble has quite a few good deals, especially with the additional 10% discount for Humble monthly subscribers. Subnautica is currently 25% off on Steam after picking up the Joystick PC Game of The Year award. One of the greatest games to have ever released. Survival/exploration game that takes place entirely underwater. Absolute no brainer, only downside for me personally is that I cannot have more!